San Cassiano usually is described as perfect destination of ski holidays for all the family, especially intermediate skiers and food lovers and we are glad that Alps2Alps offers you fast and cheap transfer, therefore you can enjoy this Italian resort and its hospitality with greatness. Located in the heart of the Dolomites in north-east Italy, San Cassiano ski resort offers one of the most spectacular views in the world - it is proud of traditional Dolomites charm and peaceful atmosphere combined with breathtaking scenery. Dolomites region was the site of World War I battles and San Cassiano is a place to learn the history with visiting many areas that pay tribute to this period. Lovers of luxury will find this ski resort a perfect destination, as it offers luxurious and first-class level hotels and restaurants. There are no direct trains to San Cassiano. Nearest train stations to San Cassiano are Brunico and Bressanone. Holidays with family might be expensive, but be sure that we at Alps2Alps will offer you the lowest possible price by taking into account all your necessities while travelling for San Cassiano to offer the best possible value for the money, every time. Alps2Alps promises to get you to San Cassiano whatever your needs with comfort and with lowest possible price. All of this above will result in our base-rate for ski transfers going down - we never over-inflate our prices at any time and for any reason. We also offer fundamental discounts for off-peak, off-season and midweek transfers to San Cassiano. If you are looking for best possible offers, travelling outside peak season and midweek typically results in the biggest savings. We offer midweek (Monday to Friday) prices with up to 60% discount than weekend prices. San Cassiano is well known for different variety of skiing courses, making it entertaining from first-timers to seasoned pros. Resort offers not only plenty of skiing options, but also Snow Park for snowboarders - everybody is welcomed at San Cassiano ski resort. 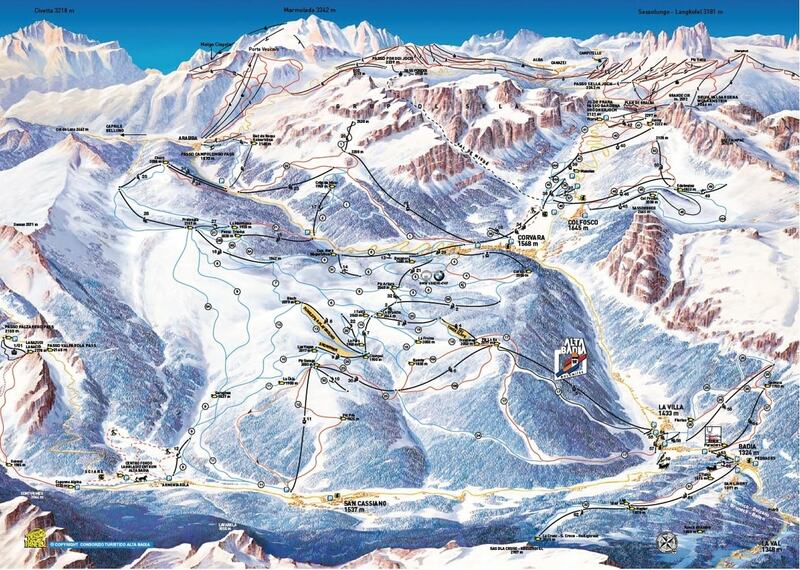 One of the best ski schools of the area Ski School Dolomites is located in San Cassiano ski resort too. Don’t forget that kids till 7years don’t need to pay for ski pass! Reliability, punctuality, comfort and the lowest price in market are the key factors when choosing Alps2Alps as your transfer partner for San Cassiano. If you’re out to get the best combination of high-quality and low-cost transfers to and from San Cassiano, be sure to book in advance. If you have any questions don’t hesitate - get in touch with the Alps2Alps customer service team today.